0.11 m3/hr/m2 @50 pa Absolutely delighted with the results. Given building regs are 10 m3/hr/m2 @50 pa and Passivhaus standard is 0.6 ach @ 50 pa, this is over 90 times better than building regs and over 7 times better than Passivhaus standards and a great testament to the attention to detail shown by the build team. Flashings between the wood cladding and the render are fitted. These were made by a Herefordshire based fabricator. Work continues fitting the cladding. We are using Douglas Fir, supplied by Ransford which is literally 5 minutes down the road. Once the roof has been laid and the weather allows, the rendering starts. We are using the Weber system, with a base coat applied first followed by a thin silicon based top coat which will be sprayed on. The roof and detailing around the dormer window are completed Once the cladding is complete and before the scaffolding comes down, we need to treat the cladding. The gable ends need a fireproof coating due the proximity of other houses, so it's one coat of primer, two of Envirograf and two of Osmo. The front and back of the house get one coat primer and two of Osmo. It's one of those jobs that costs more and takes longer than expected. We hadn't planned on having to to apply so many coats of product and in my naiveity I thought it would be a layer or two of fireproof coating on each gable. The wood looks a little orange at the moment but that is typical when new and it does weather down nicely which is what I plan to allow the wood to do. Hopefully to osmo will help even out the weathering but I have no plans to keep on applying it. The guttering is attached whilst the scaffolding is still up (Lindab galvanised) The scaffolding on the house comes down and goes up on the garage to allow the roof to be completed on the garage. The second coat of render is sprayed on and the shell of the house is now complete. After the rock 'n' roll plastering at the start of the month, the last 2 weeks have been all about getting stoned outside. The only drugs involved were caffeine and sugar, however, and the stone was for the perimeter drains around the house along with a few other bits. Inside, I've been busy decorating, of course, but photos of white rooms are getting a bit samey now, so they will be limited for the moment. I've been using Richard Moore Contractors for this phase of the groundworks, and they've been a pleasure to have on site. Really nice guys who know their stuff and got on with the job with a minimum of fuss and hassle. One of the big advantages for me of using a larger firm for this part of the work is their access to all their own plant and equipment - everything they needed was on hand when and where they needed it and I didn't need to organise anything for hire or delivery. A financial advantage of this is that the cost of the equipment is, effectively, free of VAT for me as everything is zero rated within the cost of the works. With a job this size, that can make a sizeable difference when compared with using non VAT registered labour only for jobs. This is at the start of the work, with trenches still being dug out and making sure the services that run around the perimeter of the garage are all staying in place. At this stage, everything was still in its post-winter boggy state, and the reduced dig left around the house was still looking like a very mucky moat. The moat was showing no sign of emptying so the guys pumped it out once they were ready to get started in there. Although the water around the house needed to go, we wanted to retain as much run-off from the roof as possible and divert this to the pond. To this end, all the guttering runs get collected into drains running around the western side of the house then to the pond via a drain that's been buried and comes out towards the top of the south tip of the pond. The outlet has been kept high where it exits to the pond to make sure that it doesn't flow back towards the house if the pond ever gets that full; there is also a decent fall on the pipe itself. This is part of the storm water drain that goes around the lounge, facing west. As well as putting the drains in, I asked the team to stone up for 1m beyond the building. This needs to be done anyway, but I also needed to get this done so that there is a firm base around the building for the next part of the team to put the stone cladding on, and also, once that's one, for the Contrasol guys to fit the brise soleil rails and fins outside the stairwell window. Here's the stoned up pathway along the front, going around to the west face. Whilst we're looking at the front door, I'm delighted to be able to post the following photo. For a few months now, the front approach to the house has been a bit on the wet side of things as the concrete that was spread there last autumn has gradually deteriorated with the lorries, vans and cars that have travelled over it on a daily basis. As well as having to walk the plank over some particularly deep puddles, the trigged up pallets and boards bridging the moat directly in front of the door was becoming increasingly perilous. Danger no more, however, as we now have solid ground in front of the building - luxury! A peep a little further around the corner shows the continuation of the path and the sewage tank going in. Prior to the tank going in, the old septic tank had been desludged - a nasty little hole in the ground that no one wanted to fall into. This was back-filled with stone and rubble then covered over when the spoil from the site was re-distributed. When we originally bought the site, the garden for the old bungalow ran to the north, parallel with the lane. The land has a slope to it going from the field down towards the lane, but there was pronounced hollow running the length of the garden that we had wanted to level out as this should make the area more useable in the winter, when there is a tendency for everything to get waterlogged. There was still some spoil left over from the pond, as well as everything that was dug out for the drains, so that was used to backfill. We have kept the topsoil that was scraped off the pond area, too, and this will be spread over the clay to give something decent to plant into. We are having an area of hardstanding next to the garage because, knowing what we're like, we will only be able to fit one car into the garage by the time we've filled it up with all the other stuff that can be put into an area like that, so we will need somewhere decent to park the cars. It's also useful for the sewage lorry to be able to pull in there and sling a hose over to the sewage treatment plant for de-sludging without blocking the lane. The guys have done a lovely job around there, and it's all nicely edged with kerb stones that flow into the edges of the driveway and down onto where it meets the lane. The amount of stone that's been put down on the site is large, over 100 tons, but then there's been a lot to do and we've also stoned up on the corner between the stairwell and the lounge where will we will form a patio of some sort. Here's a view of the hard standing going in, taken from the balcony. You can see where all the stones have been concreted in. And another taken from ground level. The hard standing merges into the driveway in front of the garage. The roadside edge of this has been increased in width by 2 kerb stones each side, on the advice of Matt, the groundworker. Besides looking better, it gives a much easier sweep up to the garage as there is quite a height difference between the garage floor and the lane, so turning in will be much easier with the more open drive. Here's the first of many lots of stone going down to build up the level. More of the same from the lane: Then with the kerb stones concreted in. And finally, with the kerbs along the lane/drive border. Everything there is ready and waiting for the final layer of tarmac, which will go down some time next week. Meanwhile, I've been doing yet more painting indoors, as previously mentioned. The large airless paint sprayer I borrowed from Jeremy is a little poorly at the moment and will be in the sprayer hospital tomorrow to have its tubes cleared out and should be back in service very shortly. I will need it again as I still have one bedroom to spray and I need the power of the large machine to reach up to the vaulted ceilings. However, I still needed to get the mists coats done on the landing, stairwell and hallway last week, as it was the ideal opportunity to get these high traffic areas done since I was the only one in the building. I was a bit stumped initially, but I had noticed the little electric sprayers in Lidl on Monday and then Weebles mentioned that they had bought one from Aldi. I figured nothing ventured, nothing gained and for £25 it was worth a shot. So I dashed down to the nearest Lidl in Blandford and got one of these little beauties. As it turned out, it was perfect for the job. The stairwell, in particular, is a little confined and with operating off a youngman board balanced between the scaffolding tower and a trestle on the landing, it would have been tricky to manoeuvre the larger machine around there. The little hand held sprayer did the job nicely and was much easier in the tight space, here: The results from the little sprayer are very different from the big airless system and you get a much more textured finish, but pleasant and perfectly acceptable. It is a pain having to refill the reservoir all the time, but not difficult. I poured the contract white into a big bucket and diluted in there, pouring into the reservoir. I confess that I didn't strain the paint and found that it was fine. The only time it gummed a bit was if I'd left it open overnight, but wherever there were any splatty spatters I just left them to dry and sanded them the day after. Sanding was quicker and less messy than straining many litres of paint. A couple of not very exciting photos of the hallway all masked up and misted: You can see from the masking you have to do that it would be tricky to get this part of the painting done if there were others working in the building at the same time. I've now put the vinyl coat on these areas too, but I was too knackered to take photos of that as I only finished them yesterday, so that morsel of excitement will have to be eagerly anticipated. I've also been painting the Howdens primed MDF doors and I'm pleased with how they turned out. I used a small fine textured roller and eggshell acrylic on top of 1 layer of white primer and very nice they look, too. Next week, Harry the carpenter (he's much too young to get all the Harry Carpenter jokes, we gave up ages ago) is back so he can get the kitchen finished off as the last of the laminate splashback arrived last week. He can also get on with some door hanging and then the utility units arrive next week. Nick is due at some point early next week as well, and he has it all to do given that everyone else is in the final stages of works now. The bathrooms and loos need to be done in their entirety, the MVHR unit needs to be installed in the loft and all the plant needs to be put into the garage. For my part, I have what feels like miles of skirting and architrave to get on with, some paint snagging to do and I need to organise timings on the cladding and brise soleil. I can't think too much beyond that right now, but I know there's plenty more to do after that - isn't there always?! Stay tuned, folks! Hello, If any readers have bought, read, borrowed etc my book 'Self Build Home...The last thing you need is an architect' (only £5 on Amazon btw) I welcome your feedback, comments, criticism. Jim on lofthousestudio@hotmail.com I know I've been critical of plan books on here and other forums, but I thought, for my second edition (!? )I'd include plan designs of some of my projects (realised and doomed), but illustrating and annotating a few important (well I think they are!) design features. Just a thought to stave off retirement dottage! If plasterers were musicians, mine would be Elvis (except my plasterer is still alive, obvs!) or some arena-filling brain-melting rock god, because that's how good his plastering is. Just ask Nick - he's been trying to coax him away for the last 3 weeks and he's had to accept failure as he doesn't travel (far). Anyhow, Ian the Plasterer has now left the building apart from a teensy last bit in the hallway that can't be done until the new stairs arrive, so 99% there. The week just gone saw the most challenging part of the plastering, which was the drop down the stairwell and the box section along the floor/upper ceiling run, which isn't one for a person with the slightest touch of vertigo. To get this done, the temporary staircase had to be removed and a compact but tall scaffold hired in to allow access. A youngman board was run across from the landing to the scaffold stage so that the width of the area could be accessed. As the last of the plasterboard was going up, we packed in as many of those pesky offcuts as we possibly could as this was our last chance to dispose of this within the walls of the house. It looked like some random form of plasterboard modern art as it was going up. 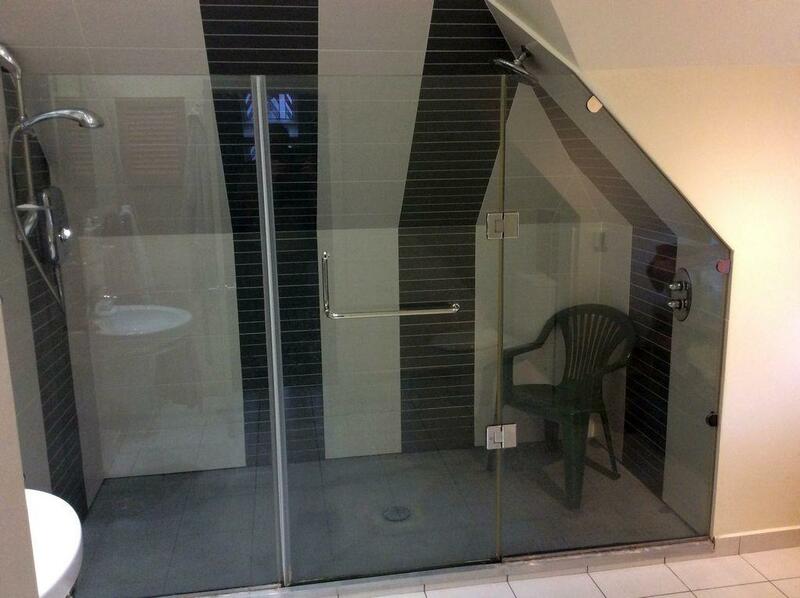 Clearly, you can see that the stairs have been removed. Also moved temporarily was the UFH manifold that's been sitting comfortably under the stairs, as we didn't want any damage to come to that whilst Ian the Plasterer was doing his thing. Here's a not very good shot of the boarded stairwell and a peek at the edge of the PB lifter putting the board onto the hallway ceiling. The stairs are now on the floor in the lounge. Whether they will return to their original position depends on how long the permanent staircase takes to arrive, which is unknown right now as I need to have a chat with a couple of people about a couple of things, but I should be ordering it early next week. In the meantime, here's the stairway to nowhere. Back to the plastering, things are looking very different now that it's all done and drying out. The building instantly feels more solid and less like a construction site. The utility room is all done now and I intend to get in there next week with Jeremy's trust paint sprayer and then emulsion. There isn't that much going in the way of units going into the utility - just 4 in total. It will house a fridge, freezer and washing machine, then the units will continue along the same wall and have a work surface running above them. I've deliberately kept it less full as it's useful to have some empty space for all the things that fill up dumping grounds voids that most households naturally have. This is the other end of the utility, going through to the garage. Lying on the utility floor there, you can see my Howdens primed MDF doors, which are destined for upstairs and one between the utility and the main house. I hope to get started on painting these soon. The doors for most of the downstairs are currently in production over in the Netherlands, due to arrive around the 5th April, and these will be fully finished so no need to paint or anything, just add hardware and hang. After some research and a little back and forth, it turns out that the Netherlands is a great place to go for over-height doors. This is because what we consider to be over-height is entirely standard to them and you can get pretty much any size up to 2300 with no bother at all. Very handy for those large doorways of mine downstairs. We've planned to have low level lights in the hallway for some time now and Nick suggested ones that can be put in flush with the plasterboard and then plastered in. It sounded like a good idea so I ordered them and they arrived a few days later. Cue panic on my part as they appeared enormous and were way deeper than I was expecting. I had to measure them several times and be convinced that they wouldn't come out of the wall behind them. As it was, only a screwdriver point did that. The lights weigh a tonne - they are moulded plaster of Paris and very odd looking things, but look good once they go in. Here's the side view of the light that needs to be lost in the cavity of the stud wall. What a whopper! And here they are once they've been plastered in. Finishing off on the plastering, here's a view of the bottom part of the scaffold tower that I've hired for the occasion. Even though the stairwell is plastered, I've kept the tower as I need to paint the stairwell and the prep for this means masking the long window, so I need the extra height for this. Ian the Plasterer was cursing the weather that day as the sun was beating in and that long window faces almost due south. He was bemoaning the fact that you could see every single ripple in the plasterboard and even the slightest imperfection stuck out like a sore thumb. Overly critical of his own work as he is, he was very relieved when it was pointed out to him that there will be a brise soleil in front of that window eventually, which will smooth out his ripples in a jiffy. The last bit of plastering is a slight change of plan in the bathroom. Originally, the slanted wall opposite the door was going to be tiled all the way to the top and the MVHR extract hidden with a false panel covered by a tile. After some discussion, it was decided that this would look horrible as the side walls are only going to be tiled part way up. We still needed a work around for where the wall protrudes to house the cistern for the wall mounted loo and decided that continuing the theme of niches in the bathroom, a large portrait-style one above the loo would look good. I suggested that the MVHR outlet could then come down via the 'ceiling' of the niche, but Nick went one better and it will come out on the right hand side of the niche wall, above the bath, and so be virtually invisible. As ever, a sharp bit of plastering from Ian. Plenty more has been going on inside, but let's step outside for a breath of air as it was busy there, too. The next set of groundworks have started. These comprise the surface water and foul water drainage, the driveway between the garage and the lane and the hard standing to the side of the garage. In addition, the surface water will now all be diverted to the pond, which overcomes the potential issue of how to deal with this on our heavy clay site. I've swapped groundworkers for this stage of the works. Sadly, my previous groundworker came through with a ridiculously inflated quote for the drainage work and as I already had another firm waiting in the wings as I have to install a dropped curb between my drive and the lane, I decided to use them for all the work as they were far more reasonable. I'm afraid there are no thrilling photos of the groundworks as it looks very similar to how the site has looked since the onset of winter - wet and boggy, with a few trenches here and there. However, I'm delighted that the drainage works are progressing, albeit with being called off for a few days due to the awful storms we've been having, as it means that as soon as they are done we can press on with the cladding and get the building properly watertight. As well as the groundworks, the balustrades for the balconies started going in last week. The east balcony is completed and the supports and railings are in on the west with the glass to follow shortly. There was a problem with a couple of panels not being the right size so I'm waiting on those, then the guys will be back to finish the installation. When I first ordered the balustrade, I had a minor panic shortly afterwards. I had requested that all the metal work should be powder coated in RAL 7016 to match the windows and be close to the colour of the slate. The panic was due to my wondering whether I should have gone for brushed steel or something a bit brighter. Come the day, however, the darker shade of anthracite grey was the right choice as it blends seamlessly with the windows and slate cladding on the upper storey, so much so that standing in the lane, the railings disappear and only the glass is obvious. Phew! Here's the balustrade viewed from the balcony. The same from the top of a pile of wood chippings in what will be the garden: And, finally, from the lane. The building looks very austere at the moment, but once the stone cladding goes on, it will be transformed again. It's a bit chilly outside, so let's go back indoors. Work has been continuing on the kitchen and the laminate worktop is in situ now, as well as the sink. Photos on that to follow next week once the clamps are off. I had been pondering the support post for the overhang on the island worksurface, and how to overcome my dislike for most of the ready made options out there. I really didn't want a metal post as it would look incongruous against everything else in the kitchen and so in one of those late night flashes of inspiration that occasionally come along, I decided to ask Harry the Carpenter to clad some timber with the laminate splashback to make a post that matched the underside of the breakfast bar part of the island. Harry did his thing, and I'm pleased with the result. Much as with the balustrade against the slates, it largely disappears into the background of the recess under the walnut worktop. I've been busy sanding and painting and all things decorating. The snug has now had its 2 coats of vinyl emulsion and I'm working my way through the prep for painting my ready-primed MDF skirting and architrave. I hate prep. Tedious, boring, and there's no way to get out of it. However, it will be worth it once all the 'woodwork' is all white and pristine. One thing that has become apparent since I painted the snug is the difference a paint base makes. The neutral colour that I'm using everywhere is called Borrowash, from Brewer's Albany paint range. In the snug and low traffic areas, I'm using standard vinyl emulsion but for the hallway and lounge, I'm using durable vinyl. All in the same shade, just a different base. So what, you may ask. Well, here's the thing. They come out different colours. I chose the colour on the basis of the standard vinyl - this is how it appears in the colour chart and sample pots, and it's a warm grey/beige, more beige than grey. The durable version, however, is much cooler and more grey than beige. I painted the lounge first with the durable stuff and a little while back did one of the bedrooms with the standard emulsion. I commented at the time how the light made them appear to be different colours except, as I now know, they really are different. It's not a problem as I like them both and they aren't next to each other in the same room, but it's worth bearing in mind if you plan to use the same colour in different bases. Here's the snug all painted up, looking out to the hallway. And another of the same. Finally, as I started the blog with Elvis, it seems appropriate to finish it with a bit of a light show. Team Blackmore worked hard on the ceiling feature in the lounge but up until now, it's been uncertain just how well (or not) it would work out with lights. Nick, the little devil, couldn't bear to wait any longer and so one evening last week, he temporarily rigged up some LED strip lights on the feature. All I can say is that Team Blackmore had a smile on its face when it saw this. 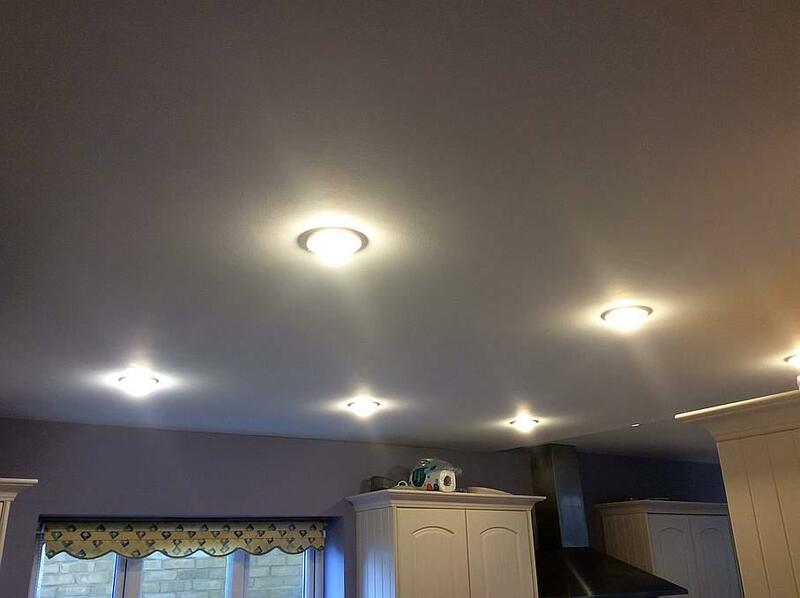 Ladies and gentlemen, may I present the ceiling lights. p.s. I was on site to do a clean up today whilst it was nice and quiet there. There had been plenty of cursing during the week as Nick started to tackle the en suite shower for the master bedroom. Foul things were coming out of both ends of him the day after his curry night and the recalcitrant shower wasn't doing much to improve his mood. I noticed this today, written on a piece of board in the base of the shower recess. We have been living in the house for almost a year now, how time flies. The Genvex Combi 185LS has performed really well, providing hot water and supplementary space heating. The MVHR system is part of Genvex Combi 185LS. One advantage of the Genvex ventilation system is that having an EASHP built in means that the supply air temperature is always slightly above room temperature even if it is not in heating mode. A standard MVHR unit would deliver air at a few degrees below room temperature, hence feeling cool, unless a post heater were fitted. I recently realised I had forgotten to write up the process we went through when setting up the ventilation. When we commissioned the ventilation system we set it up for the building regulations rates which were quite high. After the house had been signed off we changed the air flow rates to Passivhaus levels. The Genvex has four ventilation levels and the speed of the supply and extract fans can be altered for each level making it relatively easy to balance the system. To set the flow rates I used a Testo 405i anemometer fitted into a piece of flared ducting held over the supply or extract valve. The Testo 405i has a bluetooth link to a portable device running an app which stores and outputs the results. This makes the process much easier than having to write down results each time. I created a table of room volumes along with Passivhaus air change rates and from that calculated the flow rate and hence flow velocity. I then adjusted each of the room valves for the extract side starting with the room closest to the Genvex unit and then the next room further away until all the rooms were finished. This process was then repeated along with adjusting the fan speed until the required flow velocities were correctly set up for each room. This was then carried out for the supply side. We found that the set up procedure was very sensitive to wind speed, so we carried out the commissioning on a calm day. There hasn’t been much happening here since the joiner finished mid January, we started oiling the staircase and associated newels etc, we’ve had carpets laid in 3 of the 4 bedrooms, the 4th one still needs decorating but neither of us has the inclination to do it and I’ve built up a couple of things for the grandchildren’s rooms. We got a brickie out last week to look at getting the steps and ramp done but with the turn in the weather again we’ll have to wait before we can have the machine in again to dig foundations for these and sort out the driveway and garden, so today at a loose end I spent the afternoon counting! With all the talk of price per sq m I wanted to get it all added together, I knew how much cash we’d had but what with using credit cards for some things and using the current account for others and with both our wages going into this account it seemed there were days when I didn’t know how much I’d spent or where it came from! So much for the spreadsheet I started which went ok until things got really busy and I was getting requests left right and centre for all manner of things.It took me a good few hours to go through bank statements, cc statements, cash withdrawals etc but I eventually got it all counted up and receipts into some kind of order, I wanted to get this done so I can hit the ground running when it comes to filling out the vat forms but I also want to now make a spreadsheet of individual costs such as , foundations, block work, drainage and so on just in case we ever decide to do it again! I’m a great believer in fate and things happening for a reason and the two plots we are marketing there is a couple very interested in one of them subject to talks they’re having just now with the local council regarding style of build, this would leave a spare plot?! Would my OH go for it again? I don’t know, I very much doubt it but stranger things have happened, after all we didn’t mean to build this one! Oh and btw we just found out the builders company we were using has folded, apparently one of the two brothers left the company a fortnight before we parted company with them which goes some way to explaining why they suddenly seemed to lose interest and stop coming which at the time seemed strange to us as they had done the majority of the work apart from the finishing joinery which they kept telling us was 4 days work, the joiner we got in after that spent the whole of November, December and part of January finishing off and redoing some of their work which was substandard. And so almost another month has gone by but progress is still being made on the build and, just as importantly, hubby and I got away for a week's holiday in northern France just as the warm weather hit. After our abject failure at R&R over Christmas, it was wonderful to have a really relaxing break without illness or stress and come back refreshed for the final push on the build, which is just as well as there's a busy time to be had over the coming weeks. In the last blog entry, I detailed some of the painting and kitchen fitting that had been going on and there's been more of this recently. I've been getting the colour coats onto the walls upstairs but haven't managed to complete a room yet apart from the kitchen, but I'm generally pleased with the neutral colour choice. I say generally, though, because in the lounge, the different light in there makes the wall colour bring out the warm tones of the internal window frame finish which makes them look a slightly odd peach colour. It's not awful and I'm not going to change it now, but if we ever redecorate (hah!) it will be something I check before committing. For the more vertiginously challenged amongst you, you may wish to look away now, as here's a view from the top of my internal scaffold tower when I was putting the colour coat on up to the vaulted ceiling above the gable window in the guest bedroom. And here are the colour choices. The purple will be on one wall only. It looks a bit garish at the moment but once the room has its furniture and soft furnishings in, it should tone well and add a bit of life to the room. Cutting in and painting up to the high vault was a bit of a challenge, but I got there. I really didn't want to get any colour spatter onto the white ceiling so opted to use paint pads rather than a roller and I was pleased with the outcome. They give a good finish over the sprayed mist coat and are far less physically demanding than a roller. I was painting upstairs as the flooring guys were in downstairs putting in the karndean (same choice as upstairs) and it kept me productive but out of the way. Given all the work that went into making the dropped section of the ceiling in the lounge area, I wanted the floor to echo this but not in too obvious a fashion and so the team took a laser reference from the inner square of the lounge feature and reversed the direction of the planks, using a feature strip to create a subtle border. First, though, they had to screed the floor with a latex self levelling compound. In preparation for this, I needed to turn off the UFH a few days before they arrived to make sure the screed didn't go off too quickly due to the heat of the slab. I turned it off on a Friday afternoon and they started work on the following Tuesday and it was just about perfect. Once the screed was down, the floor was scraped to make sure it was completely level and then primed. After the priming, the planks were put down. Here is the snug - I went in the weekend before the flooring guys arrived to get the mist coats and ceiling painted as it's far easier to do when you only have to mask the windows and not worry about any other area. Here's the long view of the kitchen/lounge area: And here's a close up of the feature border underneath the ceiling feature: Moving on from the flooring and painting, my joiner, Harry has been busy at work on the kitchen. In particular, he was working on the large walnut work surface for the island. I decided months ago that I wanted solid walnut for the island but then, as I'm sure happens to many, I had a last minute dither and started looking at other materials instead. In the end, I decided that granite or other stones really didn't give the colour tones that I wanted and laminates weren't wide enough. I sourced the walnut from Worktop Express as they were very competitively priced for what I wanted, and delivery was quick. I looked at using their online template service, but it was just too tricky to get the different profiles right and, in the end, decided to get Harry to make up the island top on site. It was absolutely the right choice as he's done a lovely job on it. Here's a photo of the finished top with the induction hob surface mounted into it. A word on the hob. You can recess the work surface so that the hob is flush, but I preferred it to be surface mounted, sitting proud of the walnut, purely from a cleaning point of view and so I don't have to spend ages digging out crumbs and bits of food debris from around a flush recess. These are the two worktops as they arrived from the supplier, waiting to be joined together. Harry routed along their length, used a biscuit join and then glued and clamped. The worktops being clamped. They look and, indeed, are lighter in shade than the first photo as they come treated with one coat of Danish oil. Harry put a further two coats on once he had sanded the finished surface. The area where there appears to be a base unit missing and where the surface projects beyond is intended as a breakfast bar area. There will be a supporting leg on the near right hand corner. Because the kitchen and island are large, I didn't want anything to be too matchy-matchy and wanted to break up any monotonous areas. Also, I didn't fancy walnut as the worksurface leading off the sink as I think that's asking for trouble in the long run. So, I went hunting through laminate choices. Way back when I was first considering the kitchen, I had been thinking about using large format tiles with a metallic type finish as the splashback, but it was proving to be a gruelling and not very fruitful search. When I eventually revisited this part of the kitchen a couple of months ago, I came across some laminates with exactly that type of finish, nice long runs (I need a 4m run for the back work surface) and with matching splashbacks. I also wanted to line the recessed area under the island with the same material to make it more durable and give a contrast in materials and textures. I sourced the laminates from a firm called Rearo and dealt with their Newport branch. They were lovely to deal with and very helpful. Here's the splashback applied to the breakfast bar recess. Harry beefed it up and packed it out with some ply and then put the laminate edging onto the ends to give a substantial look. Whilst we were away on holiday, my splendid general builder and neighbour, Drew, got on with putting the rainwater goods up. I'd ordered in soffits and fascias from Fascia.com as they had the width I needed in anthracite grey to match the slates and windows, as well as vented soffits, which save a lot of bother and look much neater. The guttering is all deepflow and was mounted onto black fascia board. I looked at other colours of guttering, but none of them were quite right and black guttering is so ubiquitous that the eye kind of slides past it. Having it mounted on the fascia board also reduces the visual impact of the brackets that can look a bit clunky. Whilst he was up there, Drew also mounted our swift boxes and bat boxes. We were required as part of our bat licence conditions to put a bat box somewhere on site, but this is something that we had planned to do all along. Also, there has been a dramatic loss of habitat for swifts that migrate to the UK to breed in the summer and we wanted to make provision for these too, in the hope that we're lucky enough to attract them to our site. These fabulous birds migrate 6,000 miles to reach their summer breeding grounds and are the fastest birds in level flight. Once they have fledged, the only time they ever land again is to sleep and recover from their migration flight and to feed their young. They are the most fabulous birds and I would urge anyone to make provision for them wherever possible. If anyone wants details of where to buy some brilliant swift boxes, PM me and I'll send you the details. Here are the boxes, all sited on the western corner of the north facing wall. Finally, today marked a milestone in the house progress - the scaffolding is coming down. Our foul and surface water drainage works start on Wednesday and the site needs to be clear to allow access for that. Any remaining work at height can be done from ladders apart from the cladding, but I will hire a separate mobile tower of some sort for that work once I've had a chance to identify what will be most suitable. The stone cladding arrived a couple of weeks ago, ready to go up once the drainage work is done, more details of which will follow in the next post. Here's the south face gradually being revealed. The crates to the right of the picture are the stone cladding. Here's the east face slowly coming into view. And another view of the same. Work planned for this week is more plastering, more painting (if I get the chance as I'm the plasterer's labourer this week), groundworks and starting to move some young trees to the site that we've been nursing in pots at home for 12 months. 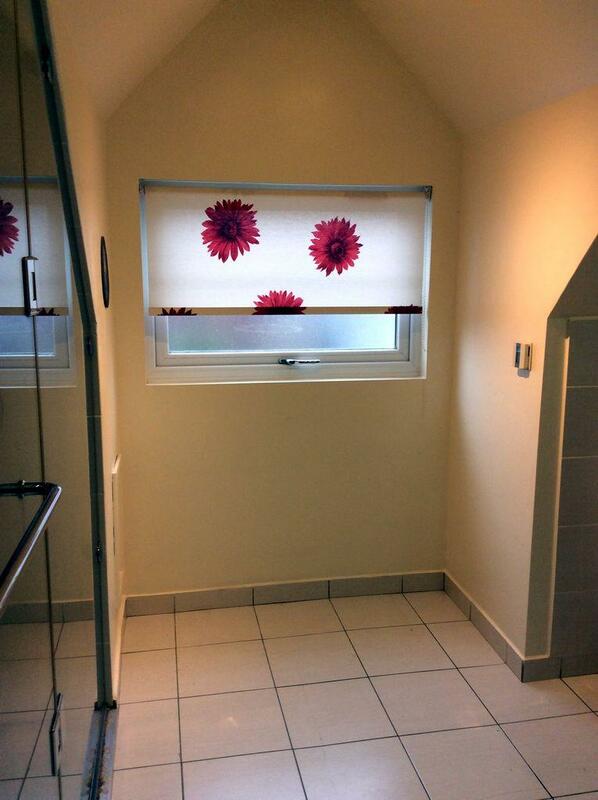 Next week, the en-suite bathroom will be started, the kitchen finished and the utility room kitted out. Plenty to do yet. TTFN. So last blog had seen me doing my first icf pour, and it was a proper baptism of fire, 3 blokes running around trying to do 4 mens jobs bloody nightmare. So next stage was to get some scaffolding up and build up the next bit, I decided to buy some scaffolding as I’m building this myself I knew it would be a long term project and renting scaffolding was going to be a complete non starter, so 4 grand later I own a load of scaffolding. As usual the walls flew up fairly quickly, until you get to a gable or a window so for some unknown reason when I designed this place it ended up with 7 gables with 2 different pitches and 17 windows. That really slowed things down a bit. from what we learnt on the last pour we knew we needed to add a bit of bracing around the windows So it all got a bit messy looking with random bits of ply every then it decided to snow so I had to bring out one of my all time favourite sayings. IN CASE OF RAIN OR SNOW TO THE PUB YOU MUST GO. So for the next couple of days not a lot happened. With icf you can fit additional structural parts as you go up even if you don’t need them yet, as when you cast the concrete core it locks in any fixings you have in place, one of these things was our roof support timbers or pole plates, these where fixed to the face of the blocks with temporary screws and anchor bolts poked into the hollow core ready for the concrete to encase them. if you look at that long timber halfway up the wall that’s our poleplate for that side of the house, all bolts are in place and restraint straps embedded into the inside of the blocks ready for concrete. Above the pole plate you can see a funny wooden box, this is shuttering to form a cantilevered beam that supports the roof, there are 6 of these in total with the longest sticking out 1900mm from the main structure, so lots more reinforcement in these and then ready for concrete. The second concrete pour went without a hint of any trouble, and we even pushed the boundaries of sensibility a few times by pouring the concrete to a depth not recommended in 1 pass without a hitch, this sounds like a recipe for disaster but we had little choice, let me explain. It is recomended that you pour aprox 1-1 1/2 courses at a time in a single pass, so starting in the middle of a wall go all the way around the house up to your 1.5 block depth or 600mm aprox, you then go around again starting at the same place this gives the concrete just enough time to just start curing very slightly, this will Norma get you to a point of having an empty truck, perfect it gives you chance to vibrate anything you need to and have a quick cuppa, then the second truck turns up and you go around again, 2 trucks of concrete or 15m and your up 3/4 of your first pour, and then so on. Well with our second pour it didn’t work like that, as we had lots of windows and funny gables the actual concrete amount was fairly small 11m but with that 11m of concrete we had to lift 5 courses of blocks, so 2 passes around the perimeter of the house meant we had to come up 2.5 courses at a time, which was a bit bum twitchy but was perfect it worked a treat. one of the beams after the last pour. feeling rather smug. Having originally planned then dropped the idea of Solar PV (a combination of budget constraints and drop in FiT rates) I recently acquired a number of Solar PV panels (a pallet bought in conjunction with @ProDave from Bimble Solar via Ebay). Having recently collected the panels, lengths of mounting rail and various other bits and bobs @ProDave had kindly sourced, I fitted the system over the last two Saturdays. First off was mounting the rails on my rear, SW facing garage wall. I decided to mount the panels vertically simply for ease - a ready made structure to fix the rails to, and easy access to a consumer unit for the grid connection. There is a penalty in terms of a reduction in annual generation compared to a sloped array, however simplicity won out. The following picture shows the garage wall with rails fixed; To start I nailed packers to the cladding to ensure I had a drainage gap behind the rails. I then fixed the rails (Unistrut - a tip from @Onoff) through the cladding, cladding battens into the timber frame of the garage using timber drive bolts I happened to have. As the lengths of Unistrut I had were offcuts (only way I could transport them) I used joiners secured to the channel with bolts/channel nuts. Finally, I added hanging brackets for each panels to help carry the weight of each panel / so I wasn't reliant purely on bolts clamping the panels in position. I fitted the panels, sitting them on the hanging bracket and bolting them around 300mm from top and bottom as pictured; The ends were secured using Z brackets I cut down using a grinder (thanks @JSHarris) so that they clamped only the frame and did not overhang the panel itself; Long M6 bolts with large washers were used to secure the panels into the rails where they met with each other; The channel nuts (also known as Zebedees) into which the long M6 bolts were secured; I used M8 bolts and channel nuts for the joiners, end and hanging brackets. My electrician connected the system up, wiring the panels to a DC isolator, into the Inverter which in turn is wired into the garage CU via a meter and AC isolator. 2 hours work for him. Switched on, the Inverter ran through all its self tests and everything okay. Sadly at that point it clouded over and the heavens opened so only a few watts being generated. Fortunately, today has been a bright and sunny day (albeit a bit hazy) and my 1.5 kWp system is as we speak, generating 1.2kW. The following shot was taken yesterday just before the rain came on, but all in all, I'm pleased with the way it looks (panels mounted so they read visually with house windows). Cost wise the system (1.5kWp plus a spare panel), mounting rails, nuts, bolts, brackets, isolators, meter and electrician (@Prodave was kind enough to give me the DC cable he had left over which was just enough for the job) total £550. I already had the inverter. Final job within the next 28 days is to notify the DNO of the installation.